Next time you light the charcoal briquettes on your barbecue or plug in the kettle to make yourself a soothing cup of herbal tea, consider the major impact coal, steam, and electricity had on the industrial practices ushered in during the Second Industrial Revolution. Now consider their effect on jewellery production. In the mid-1880s to the early 1900s, harnessing those powers to new-fangled machinery had far-reaching effects on manufacturing in Britain, western Europe, and similarly in the United States. Horsepower ‚Äì derived from actual horses ‚Äì water wheels, and energy from wood were being replaced by fossil fuels like coal. Electrical energy, a requirement for electroplating for example, was converted into mechanical energy for widespread use through the induction motor and the internal combustion engine. Ingenuity and ambitious ideas could drive all the latest scientific inventions in industrial machinery with their diverse attachments specific to each phase of production. Bigger machines required larger buildings, thereby heralding the rise of the steel industry. Jewellery-making techniques transitioned from pieces being handmade individually by a single craftsman in a small company atelier to mass production lines that followed a series of templates operated by machinists working in sprawling mills and factories. 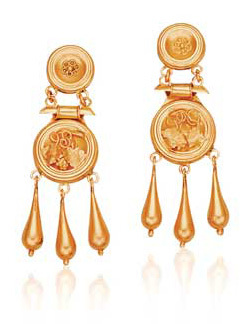 18-karat yellow gold Bulla ear pendants, with stamped disks and applied motif. Circa 1870. The movement of the populace from primarily agrarian to urbanized metropolises changed population density, demographics, skill levels for journeymen, and the number of available workers. Agricultural farm workers with little or no formal education or apprenticeship skills flocked to jobs newly available in the cities; raising or lowering a handle or pressing a button on and off required limited skill from the operator. Sons who traditionally followed in their father‚Äôs footsteps could choose other vocations, and as the fledgling industries were unregulated, it was a time when women and children worked beside their menfolk in factories. Working conditions were not ideal in terms of safety, pay was low, and the average factory shift was more than 12 hours long, Monday through Saturday. Think Dickensian conditions. Or if you‚Äôre sensitive, don‚Äôt. According to Dictionary.com, the term industrialist didn‚Äôt exist prior to the 1860s. Profitability was the key outcome desired by these captains of industry, and access to reliable, consistent energy sources changed the whole prevailing system of economics and commerce by accelerating production and ramping up the yield. As the average cost per unit decreased due to lower wages and bulk buying of raw materials, the output of items increased and the final lower cost could be passed on to merchants. 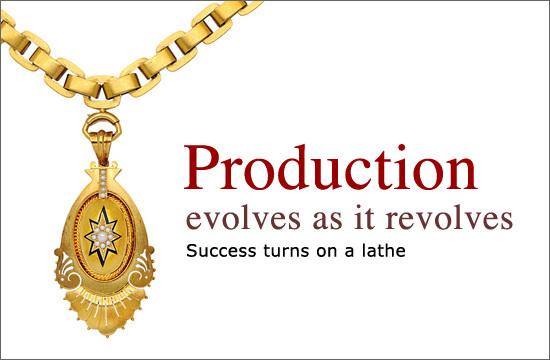 Attractive, affordable jewellery was suddenly available to the growing number of middle-class aspirants. This new demographic, at home and in the colonies, was eager and ready to spend and emulate ‚Äòtheir betters‚Äô. Think Upstairs Downstairs, Gosford Park, and Downton Abbey. Steam-powered locomotives and ships allowed a faster passage of goods and passengers. Jewellery manufactured in Europe and Britain was exported more quickly than ever before to eager buyers in New York. Illustrated catalogue order books contained a vast array of mass-produced bracelets, chandelier pendant earrings, as well as gold necklaces and brooches. In addition to the popular ‚ÄòBerlin Iron,‚Äô German factories used gold and various base metals. The best cut-steel pieces were produced in Birmingham, England, and featured distinctively riveted facetted studs, mimicking diamonds. Previously, foot pedal and manual power operated the few machines in use and differentiations and deviations that naturally occurred when something was handmade were in opposition to the perfection of product made on an assembly line. Jewellery lathes for metalwork comprised a series of bolted-on spindles, jigs, gears, pulleys, and belt drives with specialty shank attachments for each component. Small pieces of solid or hollow gold could be ‚Äòturned‚Äô rapidly in a series of revolutions that imposed a regularity of patterning, frequently a motif of adjacent fluted rings or alternatively, a surface of perfectly smooth texture. Hand tools common to watch and clockmakers were enlarged and converted to electric power and adapted for diverse uses. 18-karat yellow gold bracelet stamped, circa 1840. A blank bar or ingot could be made progressively thinner when forced over and over through tightened and rotating rollers in a rolling mill. (Picture a pasta maker machine squeezing with tighter increments and flattening out sheets of dough.) Another machine would make regular precise folds. Innumerable variations were possible depending on the desired thickness and length. Wire and hollow tubing were created by pulling and stretching flattened lengths of metal at even rates of speed through motorized draw plates consisting of progressively narrower incised slots and made thinner and thinner until the chosen size was reached; the tiniest gauge for fine filigree work and cordings was used in decorative coils and braiding on brooches. Next, cutting equipment was programmed for predetermined lengths and another machine manipulated and coiled the pieces into repetitive shapes on cylindrical mandrels of varying thicknesses. Thousands of tiny wires of similar size and design could be linked by machine to form longchains or attached row upon row to create a mesh purse. Silhouette dies and stamping templates were inserted into electrically powered hydraulic presses, creating multiple brooch outlines from flattened gold plaques under extreme force. Decorative wire edging from conforming frames made on other machines would be soldered on. Powered drop hammers embossed designs on either the obverse or reverse and in positive or negative relief. 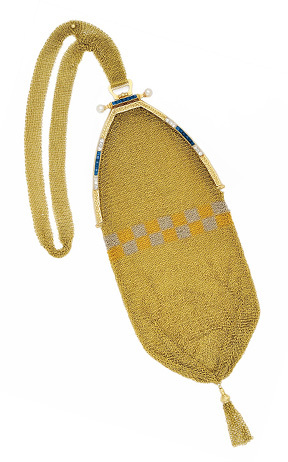 Mesh purse in 14-karat yellow gold and platinum, late 19th century. Finding like fasteners, bails, jump rings and male and female parts of clasps on bracelets and necklaces were stamped en masse. Probably the most visible and deliberate effects of a machine-driven tool is seen on engine-turned guilloche engravings with their repeating patterns. Engraving machines also followed design templates for chasing and monograms, and these motifs displayed a very regular symmetry with less detail depth, and fewer irregularities than when done by a graver‚Äôs hand tool. Marking was done with a specialized punch machine to signify the metal assay, country, city and year of manufacture or the jeweller‚Äôs trademark. The technology of diamond cutting was greatly advanced in this era. Diamonds were previously shaped with hand tools and had less perfectly symmetrical facets. The invention of the powered bruiting wheel enabled a shift in the geometric proportions of facets and the girdle changed from cushion-shaped to circular. Sometimes blowing off a little steam can have far-reaching results. Harness your own power and create a revolution in sales.